I was at a brilliant master class recently at my local farm shop. 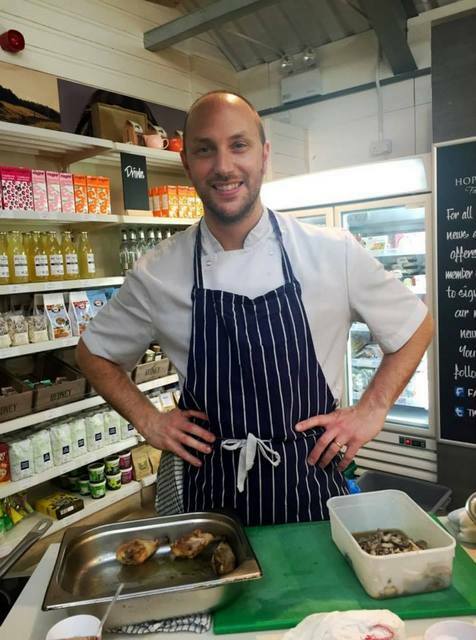 The guest chef at Hopetoun Farm Shop was Craig Wood, chef proprietor of The Wee Restaurant, who showed us some great dishes using Hopetoun’s award-winning free-range chicken and seasonal produce. I was at another of Craig’s masterclasses last May when he cooked a great range of venison dishes and I had a go at making tortellini and somehow made them back-to-front! Since then Craig’s restaurant has been awarded Scottish Restaurant of the Year for Casual Dining, and Craig himself has made the final five shortlist for Scottish Chef of the Year! All this would go to a lot of chefs’ heads but Craig remains the quiet gent and took time to tell us about his great team at the restaurant and how smoothly they have to work together in his tiny kitchen. Craig also touchingly thanked his wife Vikki for her constant support in running the restaurant, and copious buying of massive amounts of cling film! Cling film indeed features in Craig’s first dish! 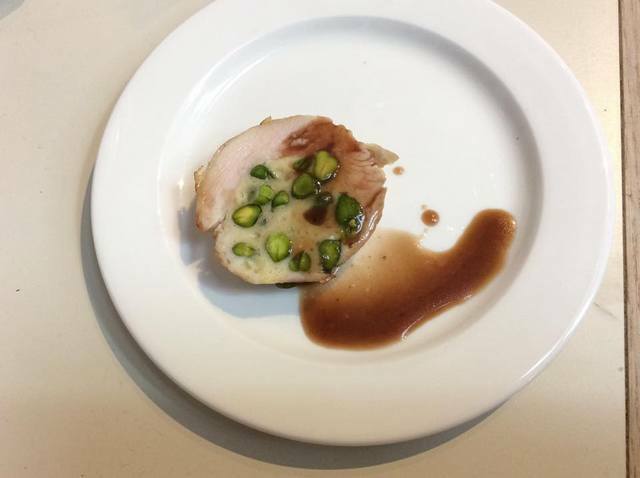 Craig flattens a chicken breast and fills it with a creamy chicken and truffle oil mousse with whole pistachios folded through it. He then rolls it up in cling film, ties the ends with more cling film and places in the fridge to set before cooking. After poaching for about 18 minutes the ballotine can be left to cool, then sliced and served cold, which would be lovely as a starter or light lunch. It can even keep in the fridge for a day or so once cooked, so great for advance-planning. This evening Craig is serving it hot with a Spiced Peppercorn Jus, so he simply allows it to rest briefly after poaching then removes the cling and gently sautées the ballotine to crisp up the skin before slicing to serve. The chicken is moist and succulent but the stars of this dish for me are the pistachios in the mousse and Craig’s amazing jus. The pistachios are the best I have ever had, not just for their vibrant colour and taste but more specifically their texture. I ask Craig later about his pistachio-sourcing and it turns out these pistachios are special indeed at £50 a bag! The Spiced Peppercorn Jus is simply divine, with great depth of flavour and a hint of China in the combination of red wines, honey and spices. I will definitely be making this jus – it is the find of the evening for me! The next dish is roast chicken and Craig makes a herby buttery stuffing to push under the skin before roasting. This dish can be made using chicken pieces, or a whole roast chicken, and Craig’s top tip is to use the handle of a smooth spoon to ease the skin away from the meat to get space for lots of stuffing. The chicken is then roasted and can be served hot, or left to cool to have in a salad. 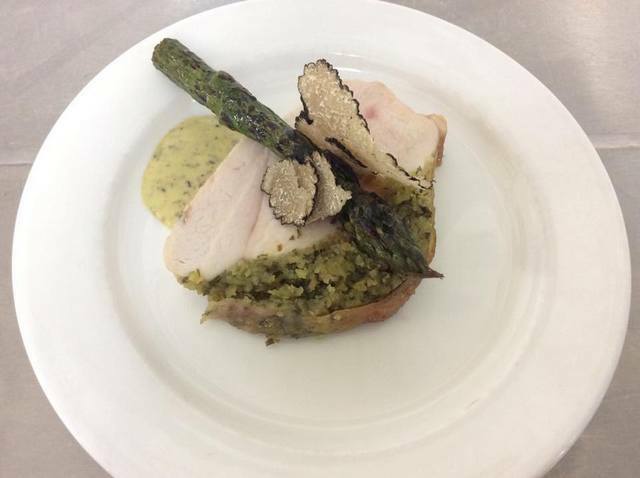 Craig serves it hot accompanied by roasted asparagus, shaved truffle and a mustard and truffle vinaigrette. The herby stuffing is delicious and the chicken wonderfully moist. It is a treat to have my first asparagus of the season, although this is not quite local as it has come from England. The Scottish season is a few weeks later than the English one. The vinaigrette is intense and overpowering when tasted alone but works amazingly well with the chicken, really bringing out the chicken taste, and its mustard hit is a perfect match for the punchy herby stuffing. This is clever flavour pairing! I was very much looking forward to this next dish, as I have seen confit done on cookery shows but have never actually tasted it myself before. We can rarely afford to eat out, so I haven’t had it in a restaurant and it always seemed a bit of a faff to fill a big pot with oil at home. It seemed even more of a faff when Craig told us that the chicken has to be cured before being cooked, which I hadn’t realised before. The curing is easy though and is basically the same method as the one I used for my home-cured bacon and pancetta but using equal parts salt and sugar in the spiced curing mix and curing for only about eight hours. This is long enough to draw out the moisture but the chicken is so delicate that any longer would make it salty. The chicken legs are then rinsed, submerged in a pot of melted duck fat and cooked in the oven at 125°C for 2 hours. Once cooked it can be left to cool and then stored in the fridge for up to five days, as the chicken is submerged beneath the fat so no oxygen can get in. To serve, remove the chicken legs from the duck fat and sauté or grill to crisp the skin. Craig just talked us through this easy but time-consuming process and then showed us how to make the Spelt Grain & Wild Mushroom Risotto. Craig had pre-cooked the spelt grains in a large pot of salted water for about 1.5 hours, then rinsed and left to cool. Spelt is a firm enough grain that it retains its structure and doesn’t get mushy when left. It can be stored in the fridge and refreshed when required. Craig warmed it through with mascarpone, parmesan, cream, truffle oil and sautéed mushrooms. The aroma of this dish is the most intense of the evening. 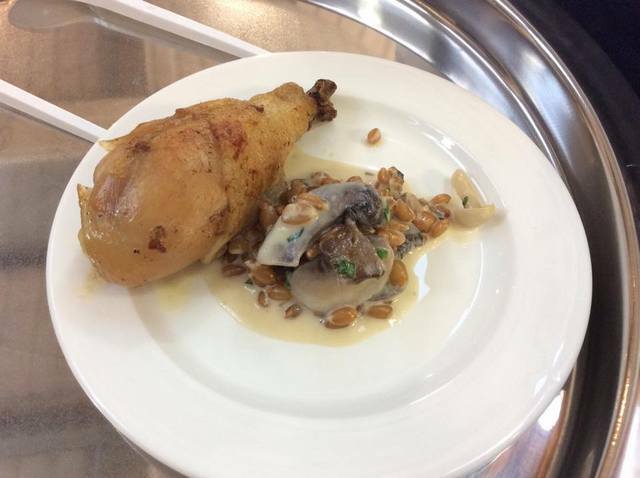 The photo here doesn’t do it justice as the way it was served to us was really fun with the risotto in little cups and the confit chicken leg popping out the top. It’d be great for a party. The fried chicken, with its crisp well-seasoned skin, tastes fabulous and isn’t the slightest bit greasy. However the surprise joy of this chicken is that the seasoning has permeating right through to the bone and that “first bite” flavour continues on past that crispy skin with every bite as perfectly seasoned as the one before. It is, quite simply, the best chicken I have ever tasted! I am won over to the idea of spending the time confiting chicken and actually, as Craig points out, it requires very little actual hands-on time. It’d be easy to do on a day you’ll be at home anyway and can tend to it occasionally. The risotto beneath the chicken is tasty and moreish. I’ve baked with spelt flour before but have never tried the actual grain. It is crunchy and chewy, in a good way like a firm barley, and with a lovely nutty flavour that marries perfectly with the earthiness of the wild mushrooms. These are three wonderful dishes that I’ll definitely be trying in my own kitchen. Thanks for a great masterclass Craig! 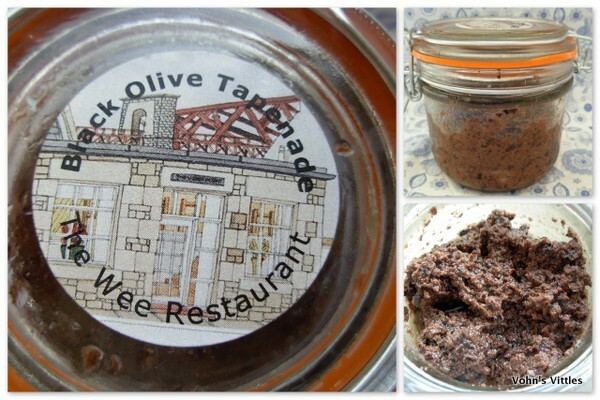 Craig’s signature ending is his gift to us all of a jar of his homemade tapenade. It’s squirrelled away at the back of my fridge and I’m determined to put it to good use in some dishes this time. Last time I just sneaked spoonfuls of the stuff whenever I opened the fridge! Shh, don’t tell anyone! Now, do you remember I told you at the start that Craig was in the top-five shortlist for Scottish Chef of the Year? There was very stiff competition but he did it! Craig was awarded Chef of the Year at the CIS Excellence Awards in Glasgow on Thursday night! I am so chuffed to bits for him. It couldn’t happen to a nicer person! Many many congratulations Craig – very well deserved! Disclaimer: I paid for my ticket to this masterclass, was not asked to write a blog post and all opinions are my own.